Not many people think of Brattleboro, Vermont, when they think of art museums. After all, it’s a small venue—only five galleries—located in a town of just 12,000 people that’s 100 miles from Boston and 200 from New York. Sometimes it’s a good thing to have some distance between you and the art establishment. The Brattleboro Museum and Art Center (BMAC) often launches creative exhibits that are not the sort you’d find elsewhere. This summer it has three strong shows. The star of the summer is Steve Gerberich, an Iowan who has an eye for what he can do with small motors, cast off objects, a vivid imagination, and an offbeat sense of humor. He says his whimsical assemblages are equal doses of Joseph Cornell, Marcel Duchamp, Alexander Calder, Robert Rauschenberg, and Jean Tinguely, but somehow I think he forgot to mention Rube Goldberg. It takes a creative mind to find a personified plastic mouse, fit it back-to-the-viewer in a box, and then imagine metal tea strainers as cat faces that move back and forth as a rodent’s worst nightmare—even if he is conducting the orchestra! In “Handle With Care,” Robert DuGrenier juxtaposes glass and objects to create self-contradictory combinations. For instance, his “In Case of Fire Break Glass” is a series of metal hammerheads attached to glass handles. “Double Burner” is a gas oven grate atop melted glass extruded below. A rusty can is shown with a milky substance pouring forth—also glass. In his own way, DuGrenier is making small jokes á la Gerberich. His are a bit more poignant, though, as a fire that swept away his barn inspired them. In such situations we learn that not even “rugged” implements such as hoes, rakes, and shovels emerge unscathed. On a more basic level, though, mixing glass and metal invites the viewer to reconsider all things prosaic. Humor has long been the stock and trade of Roz Chast, one of the best known of all American cartoonists and graphic novelists. Her “Can’t We Talk About Something More Pleasant” demonstrates the levity within the deeply tragic: the care for elderly parents and their ultimate demise. 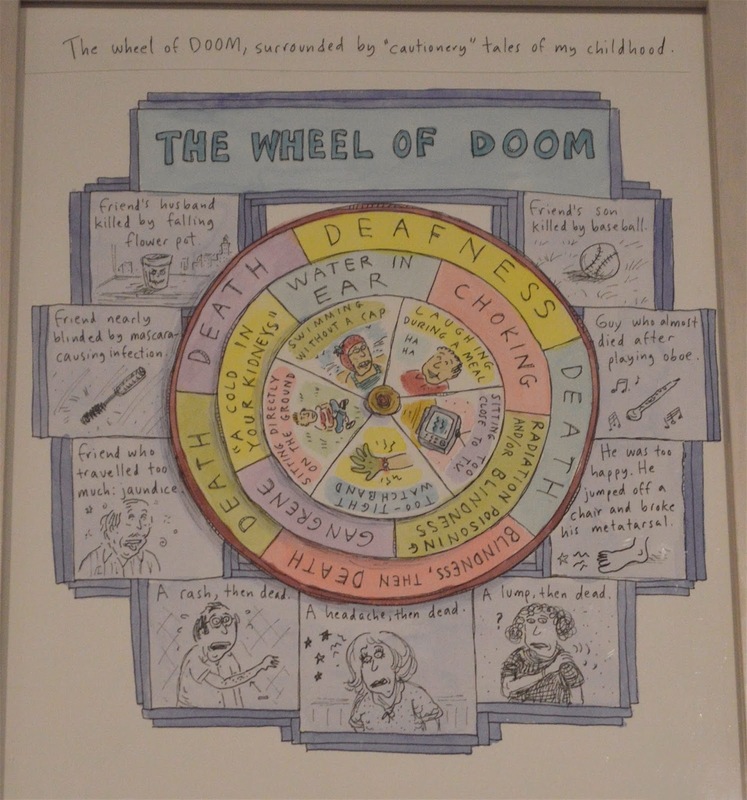 The panels on display come from two sections of her memoir: “The Beginning of the End” and “The End.” If you know anything about Chast, you are aware that she had a complicated relationship with her parents; on one hand, they drove her crazy, but on the other they provided an endless supply of mirth and material. Some would classify Chast’s work as New York Jewish humor. Although there is truth in that, her work transcends any particular religious or cultural tradition. How many of us have, at some point, shaken our heads when pondering how we managed to come from that family? And what is more commonplace than negotiating the communications and values gaps that divides one generation from the next? Chast dares wonder if these haunt from beyond the grave. The BMAC has several other exhibits that, in my view, are less successful. David Rios Ferreira creates collage like illustrations in which botany, race, gender, and colonialism intersect. Or, at least, that’s his aim. I see that, but only is glimpses. His densely layered surfaces too often come across as chaotic mishmash that's like a dinner entrée with too many ingredients. Maybe it was the obfuscatory statements he made about his own work, maybe it was the overuse of earth tones, or maybe it was that he tried to tick the box of every au courant oppression, but this exhibit never engaged me. I enjoyed the vibrant colors in “Painting Time” by Debra Ramsay, but it’s hard to get past the reality that this installation is simply strips of acrylic painted in bold hues and strewn willy-nilly onto the floor of a small side gallery. The various colors represent the four seasons. Conceptually, I like the idea of reducing time’s passage to basic colors rolled onto strips suggestive of film stock. Mostly, though, I saw only a pile of pleasant pigments. I would have been more enamored of a video showing Ramsay rolling paint and talking about how we can “see” time as flowing ribbons of color. I zipped through “Terrestrial Vale” by Susan Macdonald, her silverpoint and graphite on paper look at plants bedded down for winter. She produces spectral like renderings of bundled-up plants and captures in spirit the fragility of living things as winter settles in. I confess, however, that I have never warmed to the forms Macdonald uses. To my eye—admittedly sharpened by photography—the images appear sketchy and incomplete, as if they are black and white negatives waiting to be printed. But here’s the deal. Not even artists themselves like or appreciate all art. What’s special about the BMCA is that it’s small enough that visitors end up sampling things they’d otherwise not consider at all. I applaud it for its diversity and its boldness. And who knows, maybe one day I’ll come to appreciate silverpoint. Films about Baby Boomer idols seldom set the box office on fire. I suspect that’s because Boomers have their own memories and no one else particularly cares, though it certainly doesn’t help that so many films about the 1960s and 1970s are either dreck or uneven. 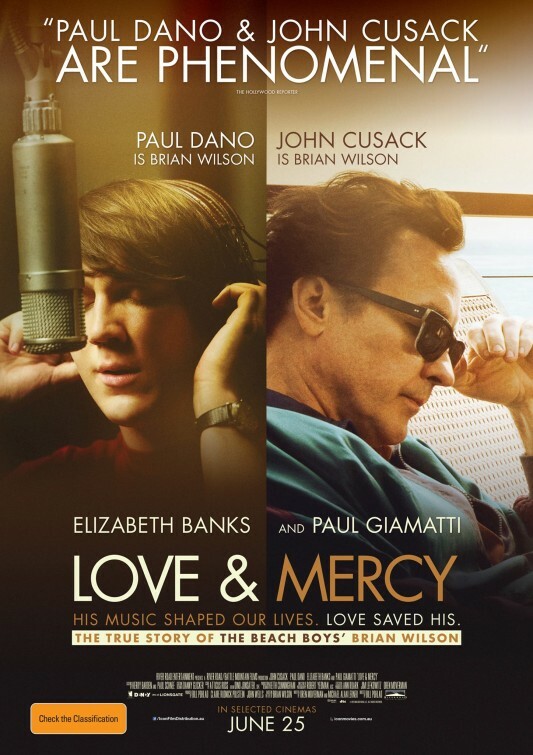 Love and Mercy, a Brian Wilson biopic, falls into the second category. Although it’s no masterpiece, it is certainly worth watching as a download or stream. That’s how most of us ended up seeing it, as it did only modest business when it went into wide distribution in June 2015. Here’s why you should see it. First, the Beach Boys were far more than the surf songs that get radio oldies play ever summertime. Brian Wilson is one of the most creative minds in the music business, and I mean that across genres. The sand-and-party hits notwithstanding, the Beach Boys’ 1966 album Pet Sounds was and is a landmark in soundscaping. Rolling Stone lists it as among the 40 most influential albums in popular music history; some claim it surpasses Sgt. Pepper’s Lonely Hearts Club Band as the most important recording of the entire 1960s. Such debates seldom go deeper than personal preference, but wherever it’s ranked, serious music critics will tell you that familiarity with Pet Sounds is an essential part of anyone’s musical education. The next time you hear “Good Vibrations,” listen deeply. On that hit single and throughout Pet Sounds, Brian Wilson reinvented what we think “rock” music means and sounds like. From the opening Theremin sounds to all the strings, horns, key shifts, and “pet” sounds—today we'd call them “found sounds” (bicycle bells, soda can percussion, disconnected background voices)— Wilson collapsed composition and genres to create music that some found “weird,” but which has stood the test of time. The second reason to see the film is that this music came from Brian Wilson’s head. Paul Dano, who does a superb job of inhabiting the mind of a tortured genius, portrays the youthful Wilson. I was reminded of Tom Hulce’s performance as Mozart in the 1984 film Amadeus. Actors, of course, are paid to pretend to be another person, but it’s another thing altogether to display how the mind works. It’s hard enough to define creativity, let alone make an audience “see” it at work. Like Hulce, Dano used facial expressions and body movements to make us imagine what the inside of Wilson’s head was like. That’s not a place most of us would wish to reside; Brian Wilson battled with mental illness, and must still use heavy-duty meds to control schizophrenia. When we meet an older Wilson—played by John Cusak—in 1986, he was under the tyrannical and Svengali-like control of Dr. Eugene Landy (Paul Giamatti), a charlatan who tore down Wilson’s ego, kept him sedated, and bilked him. The film presents Landry as a more evil version of Wilson’s authoritarian father (Bill Camp). That’s both simplistic and a contrived close the circle Hollywood device. Still, we get the point that Brian Wilson often lacked the support systems he needed. 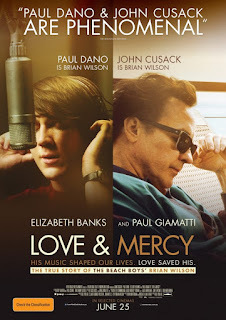 The film is essentially four acts and a coda: a truncated look at the rise of the Beach Boys, Wilson’s simultaneous creative assent and mental descent, the nadir of the Landy years, and romantic salvation at the hands of his eventual second wife, Melinda Kae Ledbetter (Elizabeth Banks). The coda, which plays over the final credit, is the real Brian Wilson performing the movie’s titular song, which he released on his 1988 comeback album. Dano, Cusak, and Banks are very good in the film. Also convincing are Kenny Wormald, Brett Davern, and Jake Abel in the roles of Brian’s brothers Dennis and Carl, plus cousin Mike Love. Graham Rogers is also solid as the fifth Beach Boy, Al Jardine. The musical sequences are all the more remarkable given that the soundtrack is a pastiche of Beach Boys tapes, recreations by the actors, and an original score from Atticus Ross. I was less enamored of the usually reliable Paul Giamatti, whose Landy was both histrionic and cartoon-like. I felt the same about Camp’s performance. As is often the case, the film also takes liberties with Wilson’s actual biography and gives him credit for several innovations that weren’t actually his. One wonders why this was necessary given that Wilson’s story is already sufficiently dramatic and unique. The film’s major flaw, though, lies with continuity lapses in the script penned by Michael Alan Lerner and Oren Moveman. They opted for flashback/flash forward sequencing that works for those who already know about Wilson and the Beach Boys, but which is clunky for those who don’t. I also found it jarring to see Dano, who looks sufficiently like younger Wilson, in one moment, and Cusak the next. Cusak is a fine actor, but he doesn’t look much Dano or Wilson. Overall, though, this is a decent look at Brian Wilson. All non-Boomers should see it to learn about Wilson’s iconic compositions. Maybe the Beach Boys will never be your thing, but Pet Sounds will change the way you hear music. Amazon Studios, 117 minutes, PG. 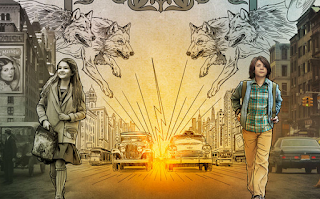 Wonderstruck is indeed a kids' film, yet it isn't. In my experience, most neither-fish-nor-fowl projects confuse more consumers than they land. That's too bad, as Wonderstruck is truly a movie that can be enjoyed by audiences of all ages. It centers on a boy named Ben (Oakes Fegley), who lives in Gunflint, Minnesota, with his single mom (Michelle Williams in a cameo). Ben is plagued by two obsessions—a reoccurring nightmare in which he's pursued by wolves and questions about the father he has never known. When Ben turns 12—the year is 1977—he asks for information on his father; instead he gets a wallet for his birthday. Soon thereafter, his mother dies in a car crash and he is sent next door to live with a relative. Circumstance sends him across the way to his old home on a stormy night—a play on the film's title—and he is struck by lightening at the moment he is using a landline to call a New York City bookstore that he thinks is linked to his mysterious father. Ben survives, but he is left deaf. Interwoven with Ben's story is that of Rose (Millicent Simmonds), a whip-smart but headstrong girl living in Hoboken, New Jersey, in 1927. She too is deaf—and no, the connection is not entirely direct; the stories are separated in time by 50 years. In each story, though, our two deaf children run away from home and journey to New York in search of an absent parent—a mother (Julianne Moore) in Rose's case. Rose's New York is a city of wonder—Broadway lights, elegantly dressed people, energy, and a palpable air of optimism. It's also on the cusp of technological change; horses vie with early automobiles for the right of way, and pedestrians know to be careful when trying to cross streets. Ben's New York a half-century later is a decayed, dirty, perilous place filled with winos, hustlers, thieves, and stack-heeled black men. It's still a wonder, but of an edgier sort. Haynes bathes Rose's New York is grey and sepia tones, as though he's providing a gauzy peek behind time's curtain. Ben's New York is in color, but one of the jarring, garish hues of late psychedelia. Haynes also adds small splashes of grounding detail. Rose's 1927 is that of Babe Ruth, radio, and the transition from silent to sound movies; Ben's 1977 is stamped by inner city blight, television, and the big Consolidated Edison power blackout. In each case, though, the children will need benefactors to survive in a city that's hard on the ears, but is positively cruel to those who hear nothing. 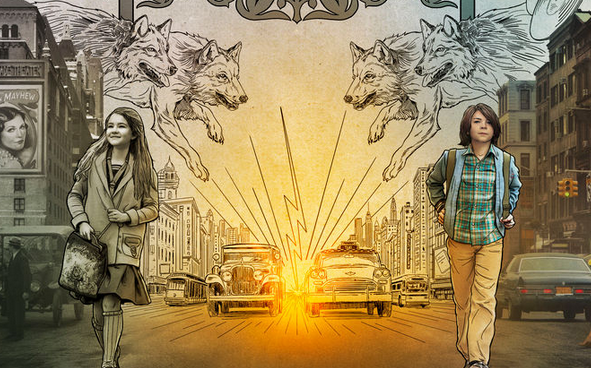 Wonderstruck is like two separate fairy tales, but Haynes stitches them together expertly into a heartwarming and uplifting story. He skirts the borders of sentimentality, but never quite transgresses them. That's quite a trick, as every part of this film could have gone too far. You will be impressed by the storytelling and strong performances—the kids are very good and Moore plays two roles—but the film's visual impact will stay with you for even longer. In addition to the light, watch what Haynes does with spaces—confined ones such as small rooms, cramped buses, and crowded streets, but also empty ones such as after-hours' theaters and museums, or Flushing Meadows 13 years after the World's Fair closed, the Unisphere already showing signs of wear. Such spaces are perfect metaphors for our two deaf children. They are, at once, open to the vast vistas that their eyes take in, but closed to subtle meanings that are hard to communicate through signs or hastily scribbled words. Maybe this film also struggled to put people in the seats because audiences don't expect such sweetness from Todd Haynes. He is, after all, known for hipper projects such as Velvet Goldmine (1998), Far From Heaven (2002), I'm Not There (2007), and Carol (2015). It may not be Haynes' usual fare, but Wonderstruck is wonderment—a veritable cabinet of curiosities. That's a clue, by the way, but you'll have to watch the film to know why!